A scab is made up of the blood clot and dried tissue fluids that form over a wound. It has an important function in keeping the wound bacteria free while the skin cells underneath divide rapidly to heal the opening. 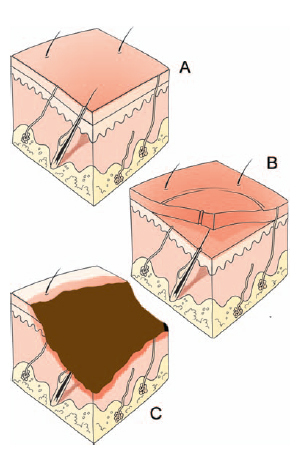 Eventually, the scab will fall off (usually within one or two weeks) and new epithelial tissue will cover the wound. In first-degree burns (A) the skin surface turns pink or red; second-degree burns (B) blister the skin; and third-degree burns © severely damage or even burn away parts of the skin. LifeART image © 2008 Lippincott, Williams & Wilkins.